Damn Good Roast Turkey will impress your Thanksgiving guests! 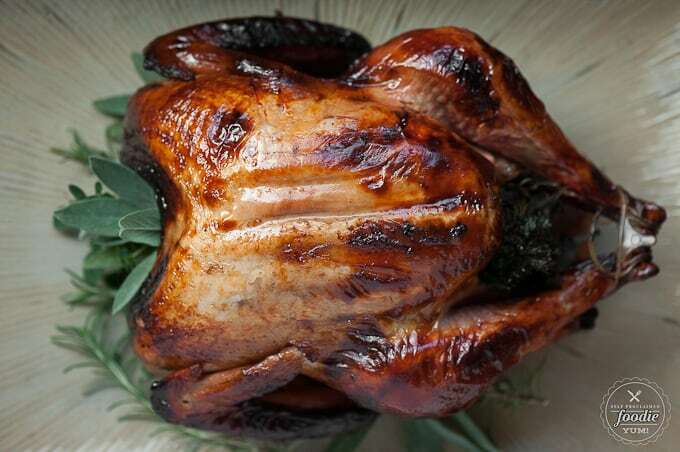 Oven roasted turkey made unbelievably moist and flavorful from apple cider brine and herbs. Damn Good Roast Turkey is what everyone wants to serve on Thanksgiving, and this roasted turkey is just that – damn good. Why is this roast turkey the best recipe? Because of the turkey brine recipe, of course! There are many more factors that go into roasting a turkey, like the quality of the meat, knowing how long to roast a turkey, and of course you need a good understanding of the roast turkey time so you can plan your Thanksgiving meal accordingly, but I’m about to share everything I know about how to make the best damn good roast turkey your table has ever seen! You know I love Honeycrisp apples. I can’t get enough each Fall. I made several batches of Vanilla Bean Honeycrisp Applesauce – this time in my Instant Pot. I made a Buttercup Squash Cake with a Honeycrisp filling. Fall wouldn’t be complete without a batch of Applesauce Muffins. I made a Vanilla Bean Cheesecake with Honeycrisp Apple Compote. I even made some Maple Bourbon Cider out of a batch of applesauce I cooked to long – a happy mistake. Well, I just about have tears of joy when I see Trader Joe’s Honey Crisp Unfiltered Apple Cider every fall. 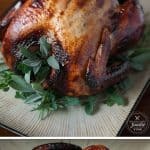 I couldn’t wait to use it to make the best turkey brine ever! Don’t get me wrong – any kind of apple cider will work, but this stuff is AMAZING. I love cooking with tons of fresh herbs. 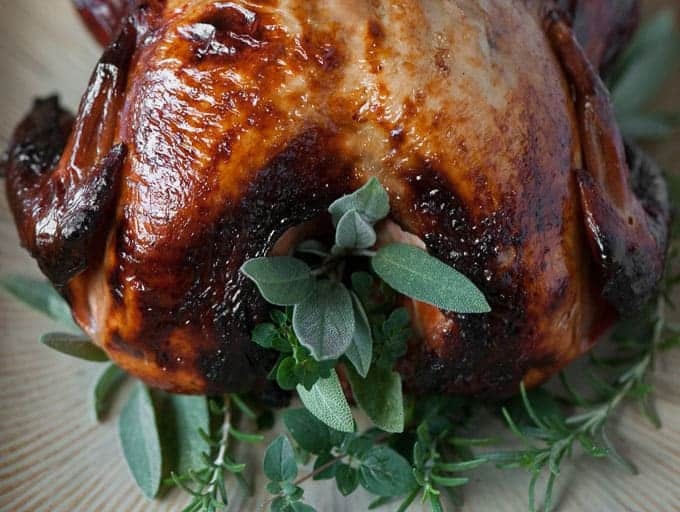 Oven roasted turkey plus fresh herbs – you can never go wrong. This turkey was roasted in our Traeger grill, but the same approach works equally as well in the oven. This roasted turkey ended up being so moist and flavorful. Everything a Thanksgiving turkey should be. This is definitely my new favorite method. And yes, your guests will be saying this roasted turkey is Damn Good. First step is to make the turkey brine recipe the day before you plan to roast your turkey. Many stores will sell a turkey brine kit, but the best turkey brine can be made in your kitchen with just a few ingredients. Combine all ingredients in a saucepan and heat until the salt fully dissolves. The basic turkey brine recipe consists of water, salt, and herbs. You can replace the water with apple cider like I did, or some other kind of unsweetened fruit juice or broth. I also recommend stuffing the cavity with aromatics like fresh orange during the brine process. To determine how much salt is needed to brine a turkey, a ratio of roughly 2 quarts liquid to 2/3 cup kosher salt is recommended. Most people ask “how long does it take to brine a turkey?”. The answer is a minimum of 12 hours, but 24 hours is recommended, and you can even brine your turkey for a full 48 hours ahead of roasting it. Once your turkey is done with it’s salty soak, remove the turkey from the brine, discard the liquid, and pat the turkey dry before preparing it to roast. This is the age old question, isn’t it? The entire Thanksgiving meal is centered around how long it will take to roast the turkey. Do you get up at 2am to start the cooking process? Or can it be done faster? The answer to the question lies within many factors including the size of your turkey, the starting temperature of the turkey, and your roasting temperature. The best way to know when your turkey is done is by its temperature. The USDA says a turkey is safe when “cooked to a minimum internal temperature of 165°F as measured with a food thermometer. Check the internal temperature in the innermost part of the thigh and wing and the thickest part of the breast.” You need to use a dependable meat thermometer. If your turkey comes with one of those plastic pop up things, don’t trust it. Below are some roast turkey time guidelines from the USDA is based on a 325°F oven, and a fully defrosted or fresh bird. These cooking times are based on how long to roast a turkey that has not been stuffed. I won’t tell you how long to cook a stuffed turkey because, well, I never roast a turkey with stuffing inside. I prefer my dressing cooked as a casserole. Also note that your turkey will cook much faster than what’s listed below if using a convection oven. 4. When roasting a turkey, be sure to account for the necessary rest time into your overall planning. Your roast turkey will need at least 30 minutes to rest in order to allow the juices to have time to re-absorb back into the meat. 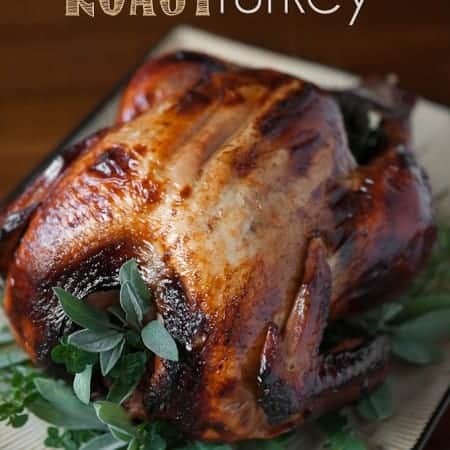 You don’t want to go to all the trouble of making a brine for your turkey and then roasting the turkey for hours, only to have it turn out dry when served. Even if your guests are starving and you feel pressed for time, you must allow your turkey to rest before slicing into it. Impress your Thanksgiving guests by serving some Damn Good Roast Turkey. Its unbelievably moist from the apple cider brine and flavorful from all the herbs. To prepare brine:Combine apple cider, salt, peppercorns, allspice, cloves, and bay leaves in a large saucepan and bring to a boil. Cook 5 minutes until salt dissolves. Cool completely. Remove giblets and neck from turkey, refrigerate until ready to use, and reserve for gravy. Rinse turkey with cold water and pat dry. Trim excess fat. Stuff body cavity with orange quarters. Place a turkey-sized oven bag inside a large stockpot. Place turkey inside bag. Add cold cider mixture and ice. Squeeze as much air out of bag as possible. twist top and secure with twist tie or tuck end so that it stays put. Refrigerate for 12 to 24 hours, turning occasionally. 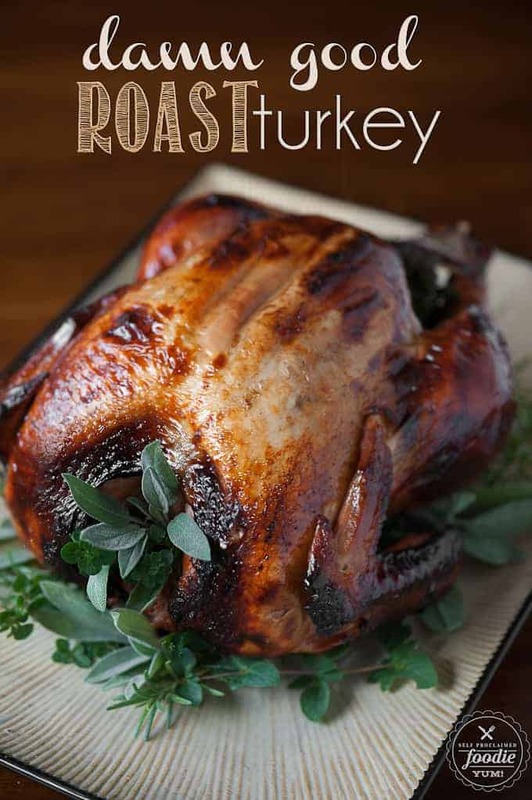 To roast the turkey:Preheat oven or grill to 450º. Remove turkey from bag, and discard brine, orange quarters, and bag. Rinse turkey with cold water and pat dry. Cut a small slit in the breast skin so that you can tuck wing tips under to keep in place. Tie legs together with kitchen string if the turkey didn't already come with a fastener. Place herbs in the cavity of the bird. Pour the broth in the bottom of a roasting pan that will be under the bird (this will also catch the drippings). Place roasting rack in pan if roasting in the oven or if using a rack and roasting pan on your grill. I cooked mine on the trager and put a pan on the grease tray under the rack, and the turkey directly on the rack. Arrange turkey, breast side down, on roasting rack. Brush turkey with 1 tablespoon of the butter and sprinkle with salt and pepper. Roast at 450º for 30 minutes. Carefully turn turkey over (breast side up). Brush turkey breast with 1 tablespoon butter; sprinkle with more salt and pepper. Bake at 350º for 1 hour and 15 minutes* or until a thermometer inserted into meaty part of breast registers 150º. Remove turkey from oven, tent with foil with thermometer still inserted, and let stand until internal temperature reads 160-165º , about 20 minutes. Reserve pan drippings for gravy. What a gorgeous looking turkey! I could totally see this on my Thanksgiving day table. Pinned! nice turkey already see it on the table. I can’t believe you are a foodie you look so young and thin. Then again I have been watching Junior Master Chef and those youngins are pretty amazing cooks. Normally I judge the people I follow by the wisdom of their cooking skills and damn girl you got em. I love your recipes and I too am a Honey Crisp SNOB!!! This was my first attempt at brining. I love your recipe and the informative directions. My family loved the turkey. Thank you so much for sharing… I shall be brining again, real soon! This recipe is so easy and flavorful! I’ve made it two years in a row, with a 12 pound and 18 pound bird, respectively. I’ve found that the skin starts starts to enthusiastically brown before the meat is quite done, but a little foil over the top fixes that while the roasting finishes up. It’s perfect served with your gravy recipe, and gets rave reviews from everyone that eats it! Thank you for the great comment! Instead of foil this year, I tried using cheesecloth soaked in butter. Looked like a nasty bandage, but worked perfectly! I’ll be adding both suggestions to the blog post. Thank you!